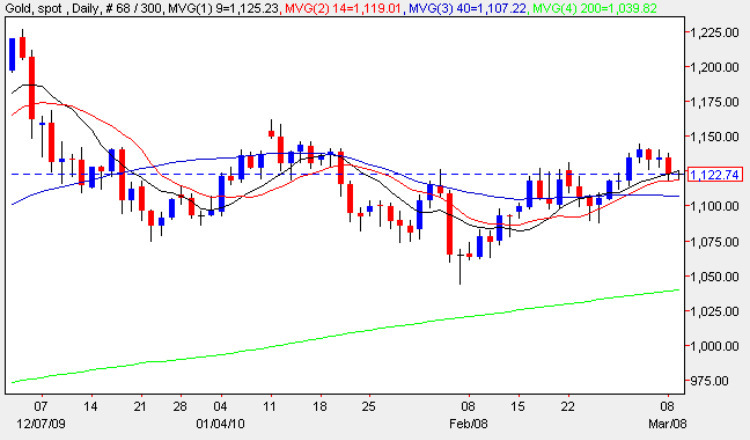 Spot gold prices once again continued to struggle to break above the $1150 per ounce price handle which seems to be proving a difficult technical area on the daily gold chart. However, yesterday’s down candle did find some support from the 9 and 14 day moving averages which suggests a degree of bullish sentiment still remains in the market. With spot gold prices remaining firmly above all four moving averages the longer term outlook remains positive, but in the short term we are likely to see a further period of sideways consolidation in this price region. For the recent bullish trend to continue we need to see a break out from this current region beyond the $1155 price level and once this has occurred then the price congestion below should provide the necessary platform for a sustained move higher once again. The lower level of this price channel currently sits in the $1060 and if this were breached then we can assume the rally is finally over and expect a much deeper move lower for spot gold prices. What is the best platform for gold trading? In my view it is Metatrader 4. Download your free demo copy of the metatrader 4 software by clicking on the following link, download metatrader free, and get started today. Will this month’s CFTC hearing assuage gold bugs’ conspiracy theories?